You may have realised in my day job I'm a mild mannered semi-nerdy mathematician/ statistician. Yes, I have the glasses and calculator collection and academic university day job to prove it. It means that I get somewhat excited about some things that the rest of the world thinks are slightly weird. Take Pi day (14th March) for example. This year was a very special Pi day. A once in 100 years Pi day. We had the first 5 digits of pi as the date (American style dates of course). Cue an amazing Pi party. I got invited to the the most amazing online Pi Party in existence with over 100 types of virtual pie and knitting goodness galore hosted by the amazing PJ. Luckily it was a Saturday so all day my inner nerd was eating as much virtual pie as I liked (there was pizza pie, apple pie, lemon meringue pie, cheesecake.... and all calorie / kilojoule free and no crumbs in the knitting). And all the while I was singing internally "It’s pi day. It’s pi day. You’ve got to cast on on pi day…." (What for, a pi shawl of course). I wanted to make a lacy pi and settled on the 100 anniversary pi shawl design - Camping. I’m a sucker for lace leaves and it has a beautiful scalloped border. I made this fairly large and at large gauge so it can double as a pi blanket. I began with Emily Ocker’s circular cast on using a crochet hook. This is so cool. I always love when I get to learn an awesomely practical new technique and this so neat and useful for my future knitting. ‘Have you seen the well known geometric theory behind what you have been doing? …. It’s Pi, the geometry of a circle hinging on the mysterious relationship of the circumference of a circle to it’s radius. A circle will double its circumference in infinitely themselves - doubling distances” (Zimmerman, Knitters Almanac). I do have to take issue with EZ about her comment about women forgetting such mathematical theory the minute we finish high school in order to fit in more practical knowledge. Clearly that’s not the case for all such women. Who says Pi is not practical anyway? It after all is applicable to knitting! (Plus I get to teach the awesome usefulness of pi to science students). I worked on dpns until I had enough stitches to transfer over to a 80 cm long circular. This was awesomely addictive knitting - along the lines of just one row more…. Because the patterns were relatively short repeats, the lace was quick and simple to execute. It didn’t lose it’s charm even when the rows were 592 stitches long (or nearly 900 in the last row!) It only took about three weeks to knit too - very quick for nearly a jumper’s worth of wool. 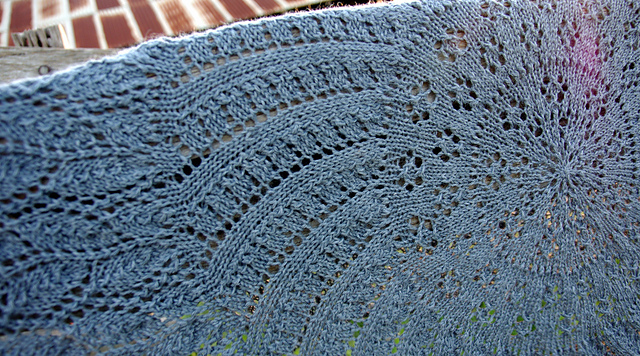 I have to agree with EZ that a circular shawl is perfect travel knitting. The knitting creates its own bag shape as it grows and you can store the yarn inside it. You can knit on public transport without losing the ball under seats. It scrunches up small enough to transport easily even when close to the end. It blocked out huge - 52 inches or around 134 cm in diameter. 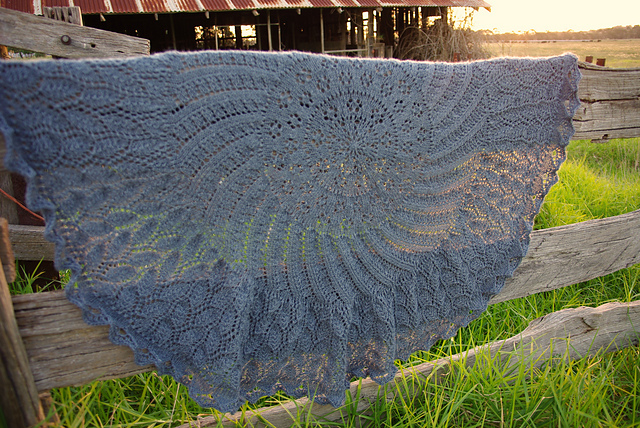 We decided this is about the largest circular shawl I can actually practically block. It took nearly the whole alphabet - 25 of my 26 alphabet jigsaw blocking mats (and most of the lounge room floor). This may be my first pi shawl but it won’t be my last one. This is coming to my next maths conference so it can hang out with the other mathematicians who truly appreciated the blend of geometry, maths and gorgeous lace this is. Pattern: EZ 100th Aniversary Pi shawl: Camping by Mwaa Knit Obsession incorporating the middle of Heliotaxis Pi Shawl by Nata's Knots - both are free patterns. Yarn: Blue grey wool blend? Recycled yarn bought from Lifeline op shop - thin 8ply weight.